At one point in the article (which discusses the merits of higher megapixel counts), I talk about taking a tray of first test tubes and then coffee cups out into a rainstorm to see how equally they collect water. I wanted a photo of me doing just that. However, getting a decent, uncluttered backdrop in such a shot limited me to only a few locations around the yard, and none of them allowed a dry location for lights or the camera. Scratch the thunderstorm idea. I decided I'd have to emulate the storm using our garden hose with the nozzle set to "shower," which would allow me to localize the spray to just the subject (me) without drowning the electronics... in theory, anyway. I got the article written up, but as the planned posting day approached, life got busy, and I never really felt the ambition to go drench myself in the yard for an evening. The composition therefore got reduced to just a close up of the tray of coffee cups. It wouldn't be nearly as entertaining, but it would be an adequate illustration and would be better than nothing. I placed a rim light behind to camera right. This was a Vivitar 283, also at 1/8 power through a 32" umbrella. I used a 1/4 blue gel to give the rim a slightly cool look that turned out to be barely visible in the final shot. Perhaps 1/2 blue would have been better. Now came the first problem. The story implied that I was outside in a rainstorm, so the background of the photo needed to look like outdoors. Of course, there was no longer any ambient light to illuminate the bushes in the background, so I needed to use my two speedlites (mostly the rim) to light them. I pulled the light stand back and aimed it midway between the subject and the background foliage. To help with fill, I laid one reflector on the ground just off camera right between the light and the bushes, and placed another reflector upright at camera left to fill that side of the scene using light from both of the strobes. I'm not sure the one at left had much effect, actually. I also opened the aperture to f/4 to blur the bushes as best I could. The resulting light on the plants isn't as smooth as you'd expect from overcast daylight, but it would suffice, and looked much more natural than a black background would have. The artificial key light was just a little cool, so I drug the shutter speed down to 1/4s to get some warmth from the incandescent porch light behind me. With the lighting nailed down, I pulled out the garden hose for the first "wet" shot. I held the nozzle in one hand pointed straight up (landing on the cups) and held my wired remote shutter release in my other hand. Problem #2: the connection between the hose and the nozzle leaks, and it squirted straight sideways to douse my camera. 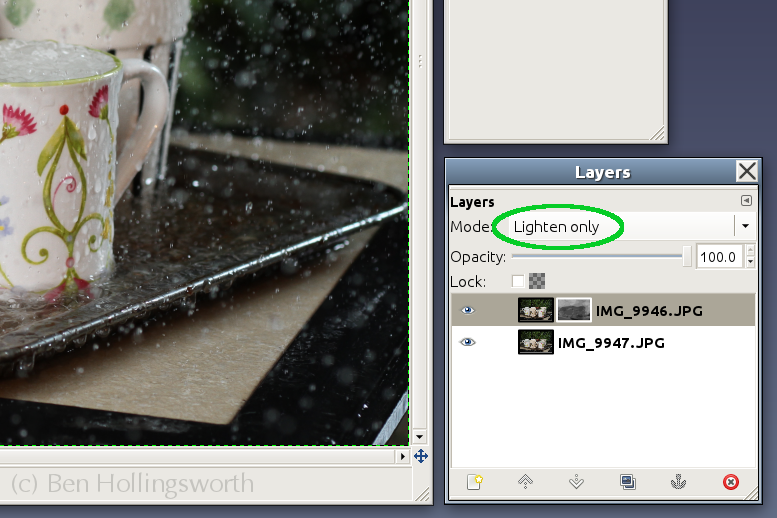 It's a good thing my Canon 7D body is weather sealed. Pity my old Micro-Nikkor 55/2.8 lens isn't. I think the moisture was minimal and remained on the surface, fortunately. I secured the nozzle, dried everything off, and it didn't happen again. What didn't occur to me until after I looked at that first shot is that my speedlights at 1/8 power are *really* fast -- fast enough to perfectly freeze every drop of water in mid air. To really get the look of a rainstorm, I would have greatly preferred to have the raindrops show as vertical blurs rather than crisp, round droplets. The ambient light at 10pm wasn't nearly bright enough for my 1/4s shutter speed to help any. Curse me and my post-dusk procrastination! If I had taken this shot earlier in the evening when the patio was adequately lit by open shade, then used my flashes to shape the cups, I could have gotten all the raindrop blur I wanted, and my background bushes would have looked better to boot. I decided that the best I could do at that point was to get as many out of focus droplets -- and as many drops total -- as I could. Aiming the hose to various locations helped, but I couldn't fill the frame with drops like I really wanted. I decided to fix that problem in post. Back on my computer, I used the GIMP to open two photos as multiple layers of the same project (File / Open As Layers). I set the merge mode to "lighten only," which shows the brightest of the images at each pixel location. Since the flash-lit droplets were brighter than pretty much anything else in the scene, this method effectively brought all of the raindrops from both images into a single scene. I did mask out the cups themselves from all but one image so that the water splashing around them didn't get blurred. The resulting image turned out about as well as I could have hoped, even if it wasn't all I had dreamed of going into the shoot. Hopefully you all can learn from both the good and the bad of my experience. If you like behind the scenes articles like this one, check out my previous one here. As always, if you have any questions or suggestions, I'd love to hear them in the comments section below.